The questions were so easy. Among the sample questions there were not questions either I didn’t understand or they are tough ones. So I didn’t get into the details on the questions, and I didn’t take a look their explanations either. If we compare Whizlabs’ sample questions with real exam ones, I don’t think that it would be sufficient for us to pass the exam. 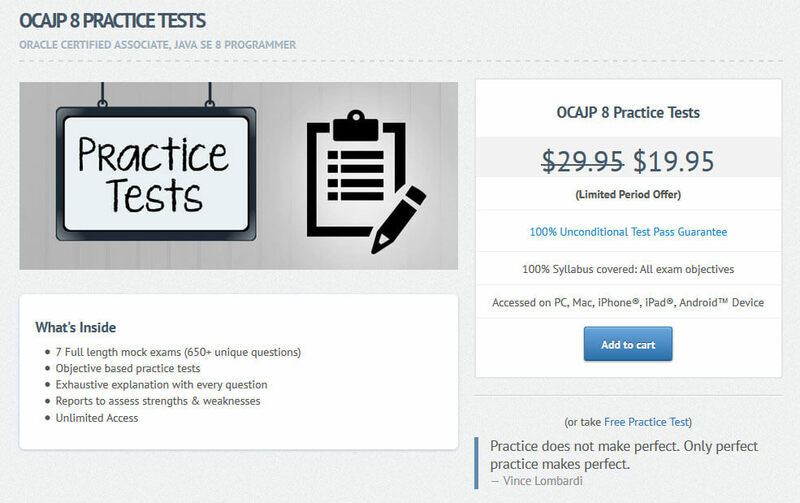 The practice exam of Whizlabs for OCAJP 8 contains 7 full length mock exams, and there are 650+ questions overall. Its price is $19.95 ($29.95 without offer). There were some flaws in explanations of the questions and so on. The practice exam is consist of 4 mock exam, and it’s 308 questions overall. Its price is $39.99. Although there are some typo errors in the questions, some of them were interesting. But, the serious mistakes in some explanation of the questions make suspicious about quality of the product. String is not mutable, but StringBuilder is mutable. LocalTime is not interface, it is a class. These mistakes reduce confidence about quality of the product. Price of the product is $19.98, now. The Enthuware has several practice exam product. In terms of price and quality the product is significantly superior than other alternatives. 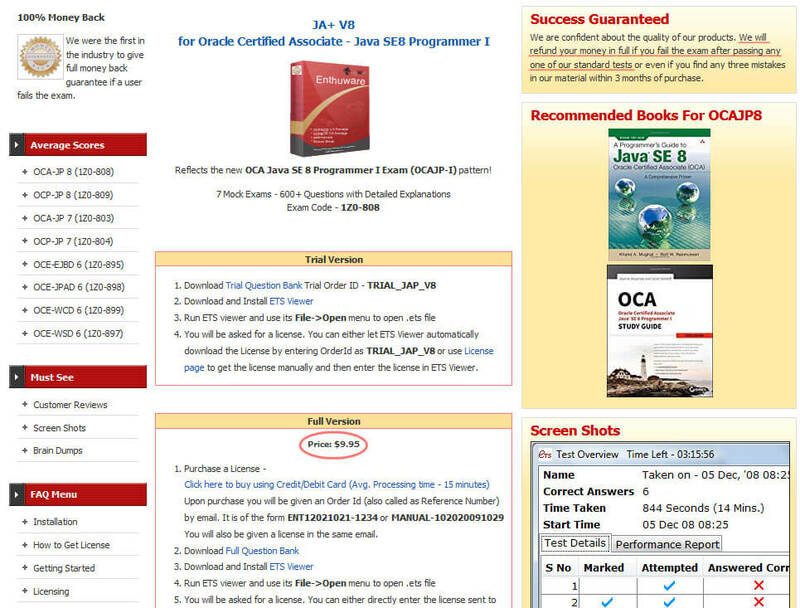 Enthuware “JA+ V8 for Oracle Certified Associate – Java SE8 Programmer I” practice exam product is consist of 7 mock exam + Foundation Test, and it is 600+ questions overall. Price is $9.95, and as a company they guarantee their products. In case either you fail the exam or you find 3 mistakes of any kind, the company will refund your money. 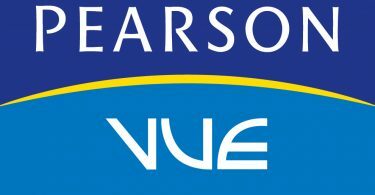 In their experience note, they note that as a practice exam they used Enthuware products and they are grateful about it who pass the exam successfully. I have bought and used the product, too, and I noticed an advantage of it significantly. It is worth to buy it. I also recommend you without doubt to buy and use it. I noted about benefits of Enthuware product that I got, in my experience note. In addition, I want to note about some advantages and features about the product to use it more effectively for new users. In this time, it is going to give you some recommendations and information about both sections of the application and the sequences to use it. 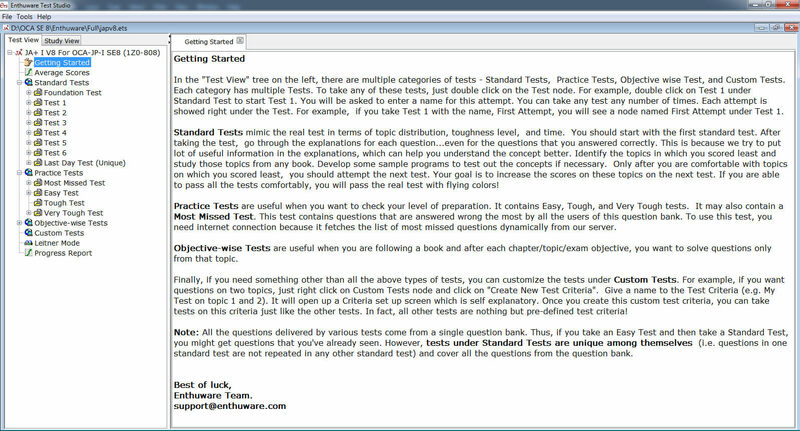 First off, it is preferred to get started with “Standard Tests” section. But it’s important to read some study guide related to certification exam before you start mock exams. Because, there will be plenty of questions that you don’t understand, unless you don’t read any study guide. This time, these questions won’t make any sense for your preparation, even if you read corresponding exam topics from study guide, then after a while you do them again. 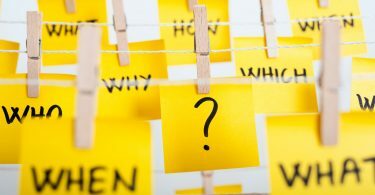 The Answer’s of the questions would remain in your memory unintentionally because you saw those questions before, and your result wouldn’t correspond to real one. The real result usually means that you get it after first effort. The experienced experts on certification exam says that if your average score result is over 80% on Enthuware Standard Test, then you can consider yourself absolutely ready for the real exam. But, It’d better 80% result would be at first effort, otherwise it might mislead you. In the “Standart Tests” section, do all the mock exams (except for “Last Day Test”) sequentially. After finishing the mock exams, re-read topics in the study guide again in which your answers were incorrect. After re-reading the study guide, you can do the tests in the “Objective-wise Tests” section related to just the same topics. Besides, you may also consider tests in the “Practice Tests” section. In this section the tests classified according to their degree of difficulty. Both the section of tests are selected among tests in the “Standard Tests” section and repeated. But, only questions of “Last Day Test” are unique and aren’t repeated anywhere, at all. It’s advisable that you do “Last Day Test” 2 days prior to the estimated exam date after finishing all preparation. 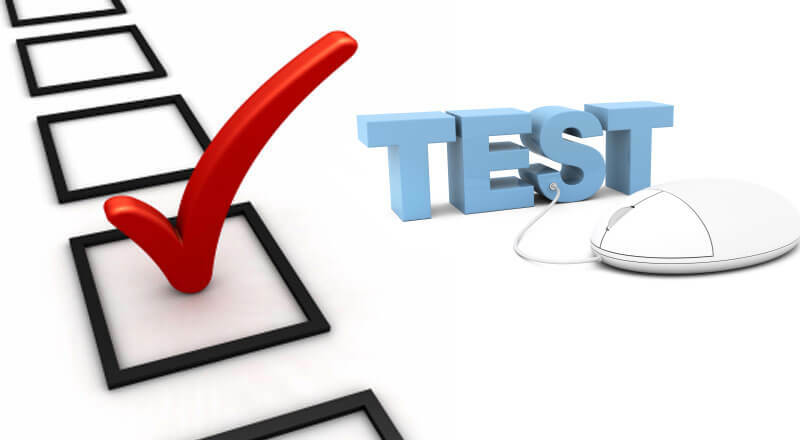 The questions of the test are very similar to real ones, and the result that you achieved from the test is usually much closer to result of the real exam. Before we get started the mock exams, I want to note that there are almost plenty of built-in features for user convenience although the application structure seems to be simple at the first glance. I have written about it in detail in my exam experience. You can see it by clicking this link. P.S. All of the above-mentioned thoughts are written based on the results I came across during exam preparation. Maybe the quality of some test banks have been improved now. Hi, I am David from https://www.springmockexams.com and https://www.javamockexams.com. I really want to thank you for this post, I am going to share it on all my social media, if you do not mind! I am also really enthusiast to announce some very exciting news: to celebrate the imminent release of Spring 5 and Java 9 we launched our simulators SALE CAMPAIGN. 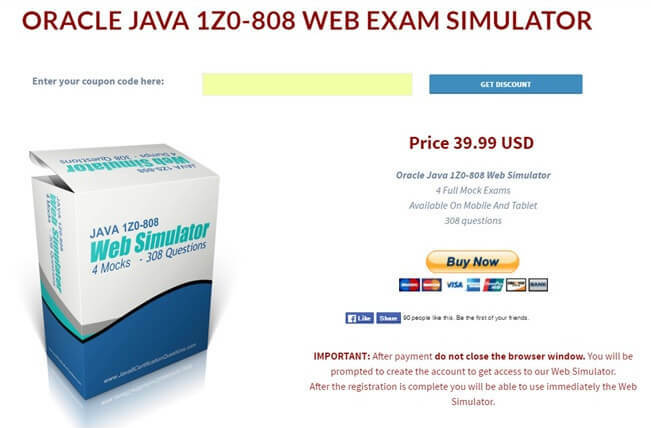 We halved the price of our simulators at http://www.springmockexams.com and http://www.javamockexams.com for limited time only. Thanks and stay tuned for your featuring on our social medias!